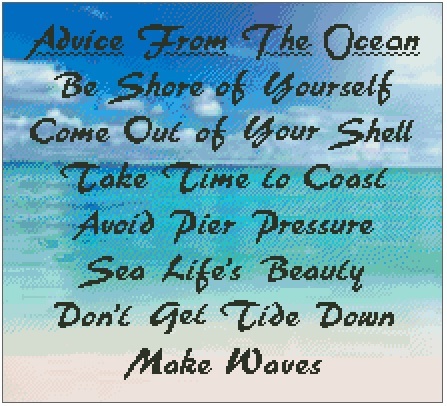 Advice from the Ocean is a full colour chart measuring 220 stitches wide by 200 stitches high and uses 30 DMC colours. A list of colours used, and their usage, is available on request. If you would prefer, this chart is available just as font without the background, and can be found in the phrases section on the website. It is also available as a kit, and can be found in that section.